Good Monday everyone! It's been snowing all day...not sure when it started since I got a late start thanks to jet lag from changing to Daylight Savings Time yesterday! Looks like at least 4" has accumulated so far. Thankful I worked the weekend and now have today off, so no driving needed and more stamping time can be accomplished! 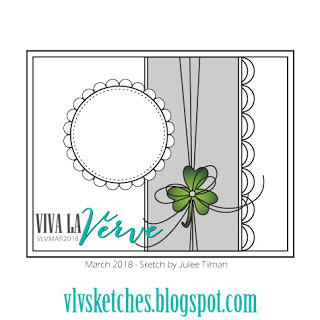 I'm finally getting around to playing with the sketch for Verve's March Viva La Verve challenge. 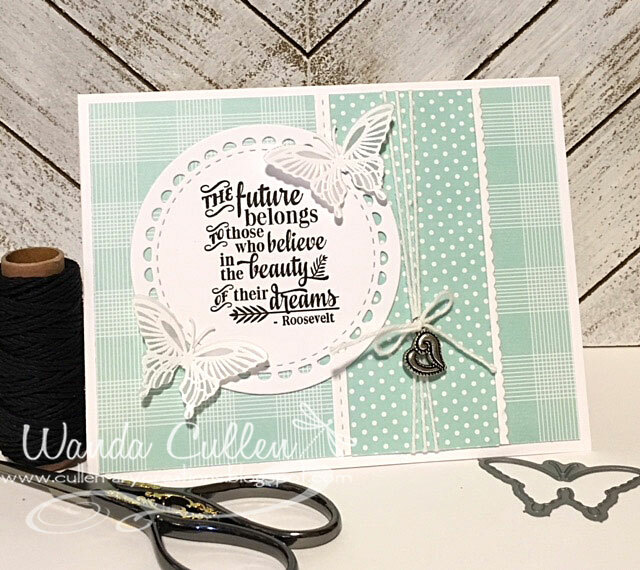 I wanted to build up my stash of graduation cards and this sentiment from Verve's Sparkly Dreams set was perfect for that! Inside the card, I added "Congratulations On Your Graduation". The butterflies were white embossed on heavy weight vellum, die cut with Verve's Butterfly Dreams die and adhered with a tiny glue dot. I also used two die sets by Reverse Confetti: Lacy Scallop Circles and Edge Essentials. Patterned papers are from Papertrey Ink's Bitty Big series: Aqua Mist. As I generally do when stamping sentiments, I used my MISTI to stamp it 3 times to get a really crisp and clear result! MAR 12 - "That Love is all there is, is all we know of Love." What a soft and pretty card, Wanda. I love the minty prints and the lacy circle. The charm is perfect for this delicate design. Thanks for the inspiration! This is so gorgoeus, Wanda! Love those vellum butterflies. So glad you could join us for Viva la Verve!